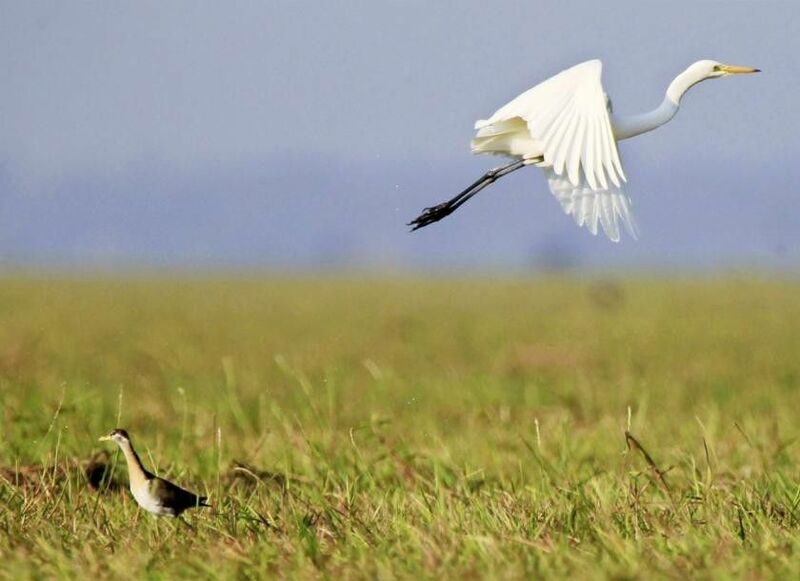 05 Feb 19 - Source: Myanmar Times - The theme of World Wetlands Day 2019 on Saturday – Wetlands and Climate Change – was aimed at encouraging people to conserve wetlands to mitigate climate change, said U Thein Aung of the Myanmar Bird and Nature Society. Myanmar has many wetlands, which consist of marshes or swamps, either man-made or natural, with either stagnant or flowing water, fresh or salt. Five are designated as Wetlands of International Importance (Ramsar sites), namely Moeyungyi wetlands, Indawgyi lake, Meinmahla Kyun, northern Moattama gulf, and Inle lake. Many people live in villages around the sites, where conservation is still weak despite the listing, conservationists said. "There is little research data on wetlands in our country. Designating the areas Ramsar sites is not enough. Further conservation work is needed because people are farming and raising livestock in these areas," said U Thein Aung. Wetlands, which comprise 4 to 6 percent of the world's surface, help to regulate climate and are an important source of biodiversity. But wetlands are being lost at a rate three times faster than deforestation, some experts said. A preliminary study last March found 100 locations in Myanmar that can be designated as wetlands – 56 onshore, 33 in coastal areas and 11 man-made, U Khin Maung Yi, permanent secretary of Natural Resources and Environmental Conservation, told a recent meeting on wetlands conservation. Policies and strategies for conserving wetlands were submitted to the Myanmar government last November, he said. Shallow areas have the greatest productivity, being rich in plant and animal life. Wetlands benefit the environment and by providing animals direct water access and habitat for rare species, refilling underground water, maintaining water flow, protecting rivers from saltwater and wind, maintaining sediment, detoxifying the water, producing energy, and providing a route for naval transportation. However, they are threatened by irrigation for agriculture, encroaching human settlement, pollution, fishing, hunting, land clearing, gold mining, flooding and erosion. "The main problem is irrigation. For example, if Kandawgyi lake were drained of all water, the carbon from decaying matter would go into the air and cause weather changes, so water must not be extracted from these wetlands," said U Thein Aung. Weather changes caused by damaged wetlands would include more lightning strikes, irregular rainfall, such as a whole year of rain falling in a single day, flooding, higher water levels and larger water areas, he said. "Rice is a staple in Asia. Paddy can live in wetlands, so it also a food source and important for agriculture, livestock, energy and transportation," U Thein Aung added. Conservation is very important for sustainable development of the wetlands, said bird and environmental expert U Thet Zaw Naing of the Wildlife Conservation Society - Myanmar. "Conservation of wetlands is weak, especially the education and cooperation of local people. Residents are crucial to conserving these places," he added. The area was first recognised as a wildlife sanctuary in 1988, and its water birds, migrating birds and wetlands are protected under the Protection of Wildlife and Conservation of Natural Areas Law. Covering 40 square miles in Bago and Waw townships in Bago Region, it is the closest Ramsar site to Yangon Region and a popular spot for relaxation and bird watching. The reservoir was built in 1878 to provide the water needed in summer to float rafts on the canal linking the Bago and Sittaung rivers. Many years later, it reverted to its natural state then became man-made wetlands. Sixteen nearby villages rely on the lake. An area to tend cattle has been set aside and residents are allowed to cultivate there and to catch fish when the water level falls, lake officials said. Electroshock fishing and the netting of an edible water bug are the worst threats to the lake's ecosystem. Recognised as a Ramsar site in 2016, it covers more than 47,000 hectares in Mohnyin township of Kachin State, and is Myanmar's biggest natural freshwater lake. Besides being home to rare species, the lake regularly has about 20,000 migratory and local birds. Nearly 30,000 people rely on the lake, mostly for fishing, but also for farming, cattle-breeding and extracting forest products. However, intense fishing and logging threaten to destroy the surrounding area, and illegal gold mining in the tributary causes sedimentation and water pollution that threaten the lake. Designated as the country's third Ramsar site in 2017, the area includes the whole coastal ecosystem, including mangroves, mud flats and turtle-nesting beaches. Endangered spoon-billed sandpipers, mangroves, turtles and other endangered species inhabit Meinmahla Kyun. It suffered damage from Cyclone Nargis in May 2008. Its mangroves are suffering from the rising demand for firewood in nearby villages. The mangroves will only be protected if villages in the area can be provided with energy, and the remaining mangroves are conserved. Designated the country's fourth Ramsar site in 2017, it covers 45,000 hectares in Mon State, from the mouth of the Sittaung river to the eastern coasts of Kyaikto and Bilin townships. The bell-shaped gulf, which covers about 150,000 hectares, also touches parts of Yangon and Bago regions, and is connected to the Bay of Bengal. About 75,000 hectares are covered with silt, and several creeks flow into it, making it the largest mud water zone in the world. Its vast area of silt provides livelihoods for local people. It has turbulent tides, and several sandbanks form each year. From 150,000 to 200,000 migratory birds come to the area annually, as it is located on the East Asian Australian Flyway. It is a main migratory stopover for the spoon-billed sandpiper, of which there are fewer than 500 left in the world. Designated the country's fifth Ramsar site in 2018, the lake in Nyaungshwe township in Shan State is a popular tourist destination and Myanmar's second biggest inland lake. It is famous for its distinctive ecosystem, including rare species, migratory birds, rich biodiversity, and proud cultural heritage. Its 131,888 acres, including Sagar lake and Moe Byae dam, were designated a sanctuary in 1985 to conserve its ecosystem and biodiversity. It was also declared an ASEAN Heritage Park in 2013, Important Birds and Biodiversity Area in 2014 and Man and Biosphere Area by UNESCO in 2015.